Elden Herrstrom, age 93, passed away Tuesday, March 13, 2018 in Spring Hill, Florida. He was born on May 3, 1924 in Tucson, Arizona, son of the late Martin Walter and Iona Cecil (Anderson) Herrstrom. 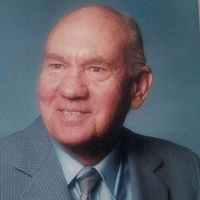 In addition to his parents, Elden was predeceased by his wife of 46 years, whom he married on May 20, 1960, Geraldine Iris Herrstrom, a sister, Wilma Clem, and a brother, Harvey Herrstrom. In 1934, his family moved to Tonganoxie, Kansas, during the depression to farm. Elden graduated from McClouth High School in 1942. He was a World War II veteran in the United States Army, serving in the South Pacific Theatre with the 13th Air Force, and the 64th Troop Carrier Squadron. He and his squadron were awarded a Presidential Citation in 1945. Elden is survived by his son, Thomas Martin of Orlando, Florida; brother, Walter Earl Herrstrom and his wife, Mary, of Louisburg, Kansas, with numerous nieces and nephews in Louisburg and Tonganoxie, Kansas. Funeral Service will be held in the Seven Hills Chapel at 6pm on Monday, March 19th. Another Funeral Service will be held on Monday, March 26, 2018 at 10:00 a.m. in Parker Mortuary Chapel, Joplin, Missouri.